We have a new Taster Flight coming out June 7, and we have a cover to show you! 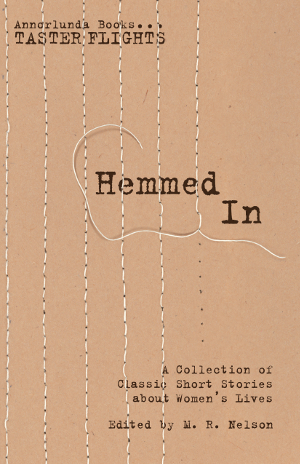 Hemmed In is an anthology of classic short stories about women’s lives. Some may be familiar to you (people have been recommending Charlotte Gilman Perkins’ The Yellow Wallpaper to us since we started publishing Taster Flights) and some will probably be new (e.g., Mary Lerner’s Little Selves), but we loved them all. The six stories in this anthology explore the limits society has put on women’s lives through the years, and the ways women have found around those limits. A theme of “what men miss” runs through all the stories. Often, the thing the men in the story miss is the entire story. The book will be out as an ebook and a paperback on June 7.